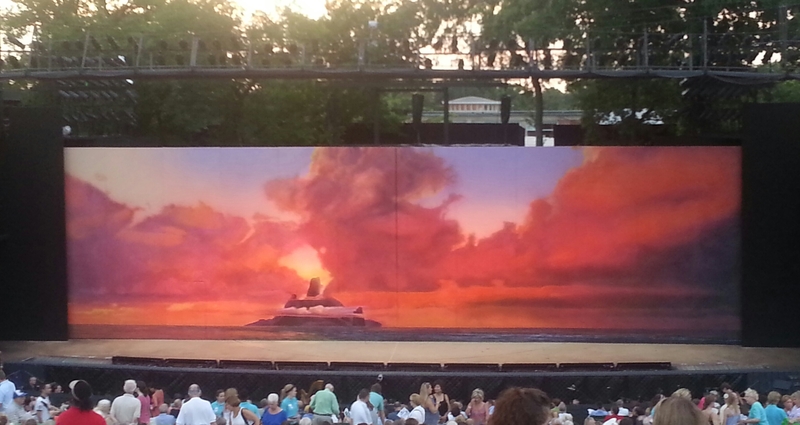 This is my first year attending the Muny’s regular concert event, Muny Magic at the Sheldon. They’ve been doing this for three years now and this is the fifth edition, featuring celebrated Muny performers and highlighting the history of the Forest Park institution. This year, going into the much talked about 100th anniversary season, the Muny’s producers have assembled a collection of classic songs saluting and remembering the leading men of the Muny, sung by four excellent leading men who have appeared in recent productions–Ben Davis, Davis Gaines, Jay Armstrong Johnson, and Mykal Kilgore. Overall, I would say it’s an entertaining, worthy tribute to these excellent performers and the legendary composers and leading men that have performed at the Muny over the years. The stage is simply set, with stools for the singers and a small but excellent musical ensemble, directed by music director Michael Horsley. There’s also a large video screen, on which is projected the pictures and credits of a host of well-known leading men who have performed at the Muny including Bob Hope, Cary Grant, Ben Vereen, Jerry Orbach, and Muny favorite Ken Page, who was in the audience and received a standing ovation when his presence was acknowledged from the stage by Kilgore before Kilgore launched into an energetic, vocally dynamic rendition of “Ain’t Misbehavin'”. The format is that of a scripted concert, with jokes and witty rapport among the foursome as they took turns singing songs associated with the Muny’s long history, as well as highlighting the upcoming 100th season with selections from each of the scheduled shows, including comic moments such as the men singing “It’s the Hard Knock Life” from Annie, as well as an upbeat performance of “December 1963 (Oh, What a Night) from Jersey Boys, Johnson’s spirited rendition of “All I Need Is the Girl” from Gypsy, Davis’s joyful “Singin’ In the Rain”, and Kilgore’s powerful “Home” from The Wiz, as well as Gaines leading the audience in a sing-along of “Meet Me In St. Louis”. Other highlights included some spectacular vocal showcase moments including Davis’s “This Nearly Was Mine” from South Pacific and (accompanying himself on guitar) “Edelweiss” from The Sound of Music, as well as Johnson’s “Something’s Coming” from West Side Story and “If I Loved You” from Carousel. Gaines singing a medley from Man of La Mancha and the classic “Ol’ Man River” from Show Boat, and Kilgore’s soaring, emotive “Corner of the Sky” from Pippin. All four men are stunning vocalists, and this show gave them many opportunities to display their talents, both as individuals and as a group on songs like “Brotherhood of Man” from How to Succeed In Business Without Really Trying, and “Fugue For Tinhorns” form Guys and Dolls. The evening was a an excellent showcase for these superb leading men, and a fitting tribute to the Muny’s past as well as a celebration of its present, and its future. It’s a great concert, with an enthusiastic and highly appreciative audience as well. I’m glad I was there to see and hear it.